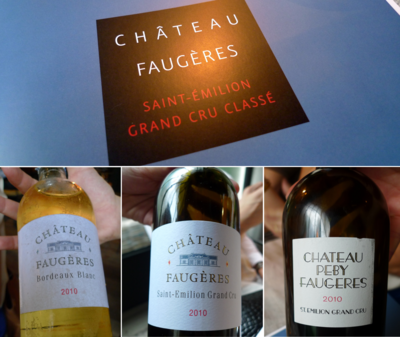 This week, Tawn and I were invited to join a small wine-tasting lunch at local restaurant Quince, featuring wines made and distributed by Châteaux Faugères. The four-course menu was tasty, complemented by an overwhelming number (eight or nine – I lost count) of enjoyable wines. Châteaux Faugères is located near Saint-Émilion in the Bordeaux region of France. I do not know a great deal about French wines and enjoyed the opportunity to listen to the owners talk about the differences between the different varieties. They seem very passionate about their wines and I look forward to searching some of them out in local wine markets. 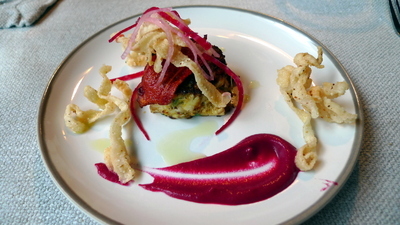 The meal began with a crab cake served with a beet puree and fried squid. It went very well with a number of whites wines, including a very crisp Bordeaux Blanc. By the second course, we were into red wines. 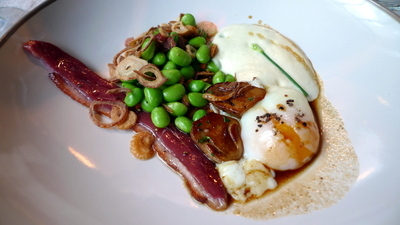 The dish was a poached egg served with a Parmesan foam, slice of duck breast, and soybeans. Very tasty dish. There was a bit of a pause between the second and third courses. By this point, we had more wine glasses going that I could keep track of. The conversation was fascinating as we had the opportunity to network with food and travel writers as well as other interesting people, some of whom we had met before, others of whom were new acquaintances. 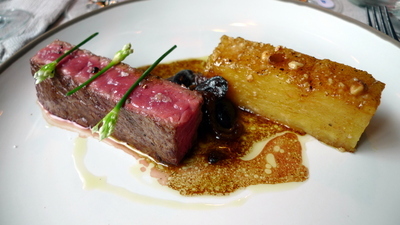 The third course was a nicely cooked piece of steak and a slice of potato galette. Very simple but executed well and attractively plated. 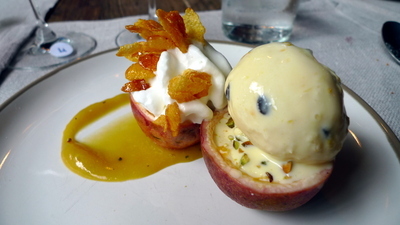 Final course, dessert, was a passion fruit panna cotta, served in two halves of the fruit with passion fruit gelato, whipped cream, and candied corn flakes. Very nice conclusion to the meal. This was our first visit back to Quince since original chef Jess Barnes left. (He is at the newly opened Opposite Mess Hall which we tried last weekend and I will soon write about.) Being a big fan of Jess’ cooking, I was curious how the quality at Quince has held up. From the looks of it, the new chef, Wilfrid Hocquet, seems to be putting his own take on the menu while not departing too far from the style of cooking that Quince has become known for. This entry was posted in Uncategorized and tagged Bangkok, bordeaux, chateau, Dining, faugeres, fine, food, Krungthep, quince, Thailand, wine by christao408. Bookmark the permalink. Fancy fancy fancy! It reminds me of a three hour dinner i had in France. A different wine for every dish. Too bad i get drunk easy, so i just took tiny sips and smell the wine. My friend gladly help me finish the wine. Some Asians get drunk easy, does Tawn? Five words: I’m pea green with envy! Ah wine tasting – it has been years since I attended one in California. Beautiful setting and presentation and wine! What a special time. I would love to do something like this someday! I could use some of that in my life. That beef looks so good. I’m glad my tummy is full right now other wise I would be licking the screen on my laptop. Everything looks really yummy which really isn’t a fancy enough word for describe such wonderful gourmet food and great wine. Wonderful photos of the event too! ooh la la. l’air delicieux.